Barbara Ehrenreich is an acclaimed social critic on both sides of the Atlantic, renowned for her trenchant, witty polemics, her pieces of journalism, and her trademark intelligence. She writes with unparalleled precision, insight and a rationalist's unwavering gaze. But in middle age, she rediscovered the journal she had kept during her tumultuous adolescence, which records an event so strange that she had never, in all the intervening years, written or spoken about it. It was the kind of event that people call a 'mystical experience' - and to a steadfast atheist and rationalist, was nothing less than shattering. 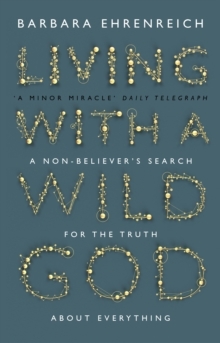 In Living with a Wild God, Ehrenreich vividly explores her life-long quest to find 'the truth' about the universe and everything else, in an attempt to reconcile this cataclysmic, defining moment with her secular understanding of the world. The result is a profound reflection on science, religion and the human condition, and a personal insight into the inner life of one of our finest thinkers. It is a book that challenges us all to reassess our perceptions of the world and what it means to be alive.